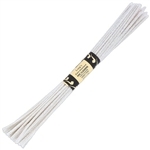 Pipe cleaners, reamers, and nails to care for your Meerschaum and Briar pipes. Pipe carpets and racks to showcase and display your pipes. For those who like cigars and cigarettes but still like the look and smoke of a Meerschaum, we have Meerschaum cigarette and cigar holders. Pipe Racks & Stands - See our full line of Pipe Racks and Stands. Meerschaum pipe replacement stems in assorted sizes and colors.